« Met Gala 2015: Charlie Chan Meets the Dragon Ladies! 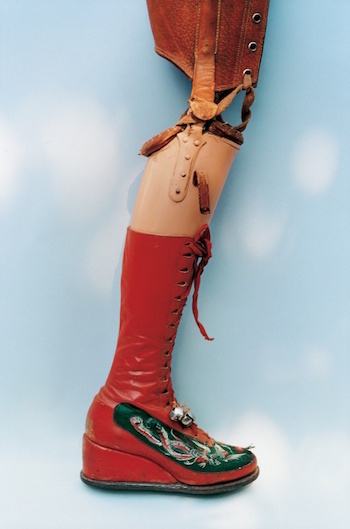 Frida Kahlo straps on her wooden leg. This entry was posted on Wednesday, May 13th, 2015 at 9:43 am by Manolo the Shoeblogger and is filed under Be Super Fantastic, Shoes. You can follow any responses to this entry through the RSS 2.0 feed. Both comments and pings are currently closed. I think I will adopt clump-jingle-jingle as my new motto. I believe your facebook post has been officially unliked. Ah…she loved red boots. With the addition of this slide show, I have seen photographic evidence suggesting at least three pairs. I do hope they were a delight for her, even in her all to frequent times of hardship and pain. All too frequent. Apologies for flubbing that sentence.